One way to feel more connected to your partner is by connecting more deeply to yourself. This is how tantric massage for couples can help you. The focus is on you, your inner connection and experience. You can allow yourself to receive without thinking about giving back, to be, without reaching for a specific goal. Through conscious, loving touch your innate sensitivity and sensuality is awakened in a relaxed way, and this may give a new foundation for you from where you explore intimacy and pleasure from. You’ll be received by the two masseurs and welcomed into the massage room. Before the massage we’ll start with a talk, and you can get answers to any questions you may have. If it’s your first visit to SoulBliss this will help you to feel more relaxed and centered, especially if you’re a little nervous (which is completely normal). After the talk you can take a shower, which helps you to become more present, and so you’re fresh and clean (we have towels and soap). 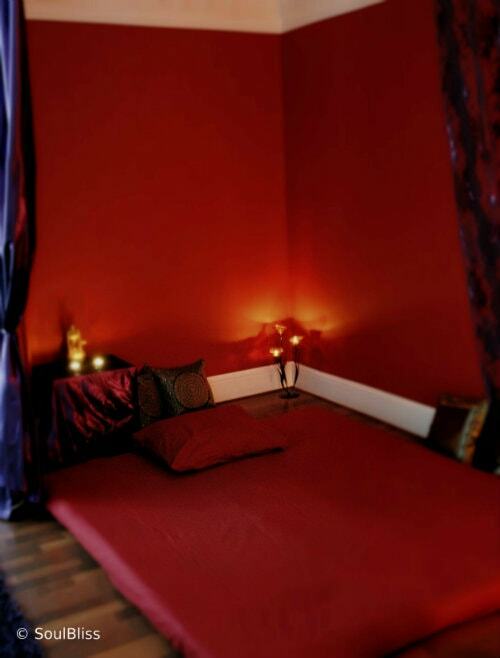 Tantric massage for couples is given in each your room. It’s our experience that you can go deeper into your own experience when you’re not receiving massage in the same room. In this way you can focus on you, your inner connection and sensations, and give room to any emotions that may arise. As your masseurs we’re dedicated to keep space for your relationship, and although the massage is a deeply personal and present experience, it’s always with a frame in respect of your relationship agreements. Tantric massage for couples is an intuitive massage and will be different from person to person and from time to time. The aim of the tantra massage is to open your senses and reconnect inwards, so that joy of life can flow freely and you can feel the aliveness of your body and the pleasure residing here. When you as a couple have a wish to dive deeper into togetherness, tantric massage for couples can be a starting point to create a greater understanding of each other, enhance intimacy between you, and to help you grow as individuals as well as in your couple relationship. After the massage we’ll get together so you have a possibility to get any questions you may have answered, and to share about your experience. We recommend booking your time in advance so you have something to look forward to. Please call +45 53377882, or email us at soulbliss@soulbliss.dk to learn more. Here you can read more about Tantra massage for women and Tantra massage for men. See options and prices at the bottom of this page along with the cancellation policy. The luxurious treat. Extra time for massage or talk.